I said I wouldn’t. After travelling with my own car for ages, watching tour bus upon tour bus descend on our pristine sights, I said I wouldn’t. But I have. I’ve joined the Stray bus. And frankly, I couldn’t be happier about it. Don’t worry, I haven’t abandoned Sunny (our rental car) completely – he is trucking Sarah to and from Auckland as we speak. But having the car by myself isn’t economical – gas prices are just way too expensive unless you are sharing the costs – and the bus is a fun way to meet new people and not have to worry about driving. I haven’t seen much of Auckland apart from where Sarah works and the front door of Base hostel. It’s somewhere I’ll explore at a later date, but we do get a great view of the city from the top of Mt. Eden, a dormant volcano. There is a huge compass there with distances on it, which reminds me just how far away I am from home! We then travel up the Coromandel peninsular, another beautiful spot which is similar in a lot of ways to the Bay of Islands. Again, more stunning beaches – tough life, eh? The bus driver, Nana, drops us off at Cathedral Cove. We spend some time taking silly pictures and cursing other tourists who get in the way of the perfect shot… despite being annoying tourists ourselves. We arrive back at the dorm to the smell of fish, sausages and lamb chops on the barbie… can’t say we don’t eat well on the trip either! After a huge feed, cooked by our awesome driver, we head out to Hot water beach. The sun is already setting and the beach is empty – that is, until we spot where the thermal pools are. There, despite the chilly early evening temperatures, girls are lounging around in bikinis and men in their swimsuits. The guys on the stray bus are carrying the shovels and preparing to dig. It takes a while for us to find the right spot (and eventually some of us usurp the holes already dug by other people) but once we do, hot water pools up out of the ground like an instant bath. The sea rushes up to the very edges of the pools, always threatening to cross and drown our hot baths with its cool, salty water but generally keeping its distance. The result is heaven. The water is a gorgeous temperature, as long as you avoid the places where it is scalding hot. We relax in the pools until night falls and we have to find our way back to the bus by moonlight. Post-beach follows beer, poker and a discussion between myself, Manuel, Cameron (a fellow Canuck) and Lofty on what practical jokes to play on the other people on the bus… none are acted upon but I did learn never to share a room with Manuel. But we had to reach the Bay of Islands. Paihia is where our cruise departs from but it is more than just a pretty place. 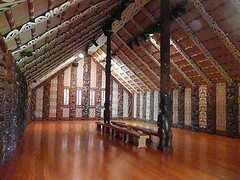 It is also home to Waitangi – the birthplace of New Zealand as a nation. Sounds cheesy, and it is. Especially after learning how badly they treated the original founding document (known as the Treaty of Waitangi – it was almost completely eaten by rats). But some insightful person realized just how unique this agreement between the Maori and the British really is. I’ll skip all my contemplation on how Canadian Aboriginal people could have benefited from such an accord. The treaty grounds are beautifully restored and the Maori maere (meeting house) is awe-inspiring. The inside is covered by intricate wooden carvings and marginally creepy “tiki” dolls with paua shell eyes. We explored until it was time to head down to the wharf for our cruise. It turns out that our cruise is on board a very odd-looking, rust red converted car ferry. We met our dorm mates (assuredly two members of the Russian mafia torn straight from the pages of “Night Watch,” the Russian vampire novel I was reading at the time). 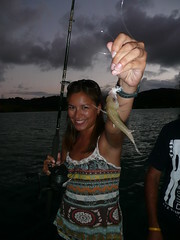 Right away we are thrown into the fray and there’s a shooting contest – at which I am truly crap – and fishing off the back – I have photographic evidence that I caught something HUGE! Dinner is a bbq, complete with the fish (snapper) just freshly yanked from the water and some of the most enormous green lipped mussels I have ever seen. Delicious! After tea, they pull some kayaks down into the water and we paddle into the night. The bay is home to bioluminscent algae. In English? Magic. As our paddles cut the surface, bright sparks of light jump through the water. A fish gliding through the dark looks like a shooting star. I feel like I’ve entered some kind of twilight zone where every movement I make in the water is accompanied by a glow of light. It’s even better when we go for a swim. The water is cold but it’s hard to resist swimming with the phosphorescence. Underwater looks like a fireworks display. I wish it were possible to photograph the phenomenon, but it’s just something I’m going to have to remember, and talk about to everyone. The next day, bright and early, we anchor close to a little shelf of rock and dip in the water. It’s here that we are diving for more of those great big green lipped mussels we ate earlier. Well, really it’s the crew that are diving for them – when they bring them up they split them open and hand them to us, so we can feed the fish with the insides. The fish come right up to our hands and chew at the mussel. Some of them end up nipping my fingers but its all in good fun. A couple of us try to dive for mussels ourselves – I can’t get down deep enough in one breath and once when I did, it is impossible to rip those buggers off the rock! Some are successful – not without a few scratches on their hands though. We landed on one of the islands in the area and are treated to a little history of the area. After spending time kayaking around the coastline exploring caves and relaxing on the beach, we get back on the boat to taste some seafood delicacies – including sea urchin eggs and raw mussel muscle. Not too bad, but I wouldn’t pay $800USD/gram! A day in Maitai Bay is the perfect remedy to long drives. 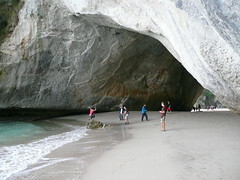 Located at the very tip of the karikari peninsula, it is a stunning curved bay with a campsite right on the beach. It is an uber cheap campsite too ($8 for both of us!). After that, we zip up Cape Reinga to the northernmost point in New Zealand. 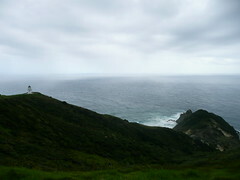 It is rainy and windy but that’s the perfect weather in which to see the Cape in all its wild and untamed glory. The very tip of Cape Reinga is sacred as the entrance to the Maori underworld… spooky. The West coast of Northland is known as the “Kaori Coast.” Kaori are absolutely massive trees and forests of them used to cover the whole of New Zealand. Now, only a few exist, but the ones that do are absolutely enormous. We go out of our way to see the biggest and second biggest trees in NZ, both around 2000 years old. The last stop on our beaches tour of Northland is Piha, on the outskirts of Auckland. The sand is dusted with an iron black coat, and the beach looks rugged and forboding. The surfers are amazing, taming the rips and tides we’ve been warned against swimming in. We arrive at sunset and take in the pinks and oranges that dance across the beach. I draw a huge map of the world in the sand. Unforunately for us, there is no petrol station in Piha. As we pull into the campsite, the fuel light gleams an ominous red. Come on Sunny! When we leave Piha the next morning, its a nerve-wracking 30km drive to the next fuel station, with me at the wheel absolutely petrified of breaking down. Never again! Wellington is a beautiful anomaly – bright blue sky one minute and stormy clouds the next. The single constant is the wind. It’s the one place I’ve been in the world where you can watch the weather change in front of your eyes. Looking up at the clouds, you can see them getting buffeted by the winds, moving them out over the Cook Straight. To take advantage of the nice weather (and it was nice about 75% of the time – for the rest, see the fickleness I mentioned above), we venture up the cable car to the top of the Botanic Gardens. The walk back down into the city takes us past widespread vistas of Wellington and through beautiful rose gardens. We also check out the “Beehive” (a Wellington architectural icon), the Parliament buildings and also to our final destination – Te Papa. Te Papa is NZ’s national museum and it deserves the title. Huge and sprawling, with four floors of interactive and interesting displays, Te Papa has to be one of the best museums I’ve been to in ages. I’m finding NZ Maori history really fascinating and there is no shortage of places to learn about it. Unfortunately, we are pressed for time and don’t get around the entire museum. I wonder if you can really do it justice, even with a whole day. When I make it back to Wellington I’ll pay another visit, that’s for sure. I’ve got a lot of ground to cover over the next few blog entries – I’ve literally covered a lot of ground! Our stop in Napier wasn’t what we expected because of a bad turn in the weather. Maybe this is the curse striking again, but many of the farmers out there see it as a blessing! Napier gets its claim to fame by being flattened by an earthquake in the early 1930’s and rebuilt in Art Deco style. After a quick visit with Lofty’s friend Naomi and a tour of the earthquake museum we headed off to Hamilton to watch some test match cricket – Black Caps vs. England. At last! Our luck begins to change. We arrive at the cricket grounds and the forecast is for sunshine. It is a good thing too, as we claim a spot of the grassy hill designed for spectators. Lofty fills me in on some of the rules and jargon of the sport and on the players (like Sidebottom – ha!) England are bowling. We spend the rest of the day sunbathing, picnicing and occasionally cheering the odd wicket (don’t I sound in the know?) The afternoon is languid apart from the jeers of England’s “Barmy Army” fan club – but I’m pleased to say I didn’t need to break out the book once! It does feel very strange to be without Sarah after basically living inside her pocket for the past 5 months. Our separation took place in Dunedin, but not without a few last minute jaunts. Along with my new travel buddy Lofty, we hit up the Otago peninsular and watched an albatross soar through the air; we visited the inside of the Cadbury’s factory and gorged on free chocolate; we saw lots of creepy taxidermied animals and more interesting Maori exhibits at the Otago Museum and we ate amazing steak which we cooked ourselves on 400degree stones. Having missed out on the Earth and Sky astronomy tour with Sarah the first time around, I was determined to make another attempt. This time, success! The bus took us up to the top of Mt. John, where Canterbury University hosts their telescopes. The bus couldn’t use its headlights because of light interference with the powerful lenses, so the driver carefully navigated up the windy mountain road in the dark… scary! By the time we reached the top, our eyes had adjusted to the darkness and the sky was wonderfully clear. Still not a patch on the Serengeti and especially not on Abel Tasman, but still clear enough to see major star action. Our guide was a young amateur astronomer from Finland who could talk incessantly about the stars. She pointed out the Southern Cross (I’ve finally seen it!) as well as our closest neighbouring star, Alpha Centuri and the two planets in the sky, Mars and Saturn. We then got to use the telescope to see the constellations. Seeing Saturn through a powerful telescope has to be one of the coolest sights of the night sky. The rings were perfect and you could even glimpse one of Saturn’s moons, Titan. I learned, and then witnessed for myself through the telescope, that Alpha Centuri is really made up of two stars orbiting each other. 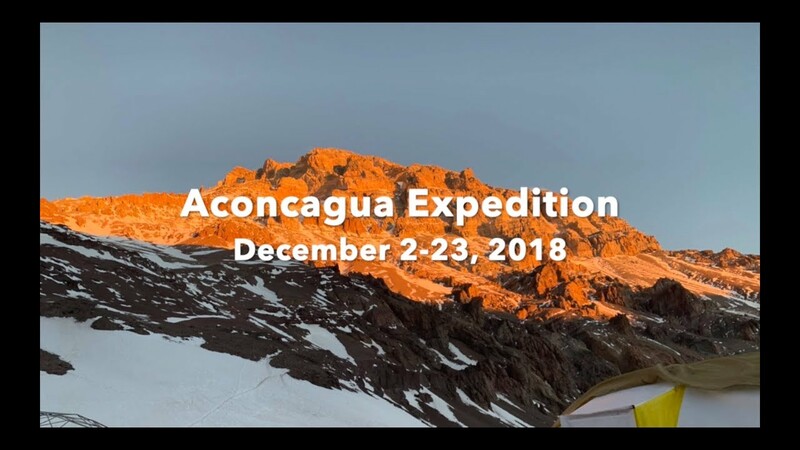 After that, the clouds came in to obscure our view of the heavens, so we warmed up with some hot chocolate and left the mountain, lights on this time. The south island of New Zealand is out of this world. I had so much fun exploring all it has to offer, and I still didn’t get to see all of it. I will find myself back here, I feel it in my bones. There are too many ties that lead back to NZ for me to ignore. But moving on is always exciting, and I’m not leaving the country yet. The Interislander ferry is supposed to be one of the most spectacular ferry crossings in the world. But as luck would have it, it seemed the south island was as sad to see me go as I was from it… hard sheets of rain fell as we pulled out of Picton on our way to the capital city of Wellington. It was still raining when we arrived and Castle II protested violently against being set up in the howling winds. Wellington is by far the windiest place I have ever been in. All through the night, the wind battered our tent. We had to get up three times in the night to peg it back down and even then the flexible poles bent themselves inward as if they were being contorted and mangled by some torturing puppeteer. Finally, dawn broke and the tent settled… for the time being. For as anxious as I had been about the tent during the night, I could only imagine what would happen to it during the day, with nobody inside it to hold it down! It did survive, but only just. They don’t call Wellington the ‘windy city’ for nothing.